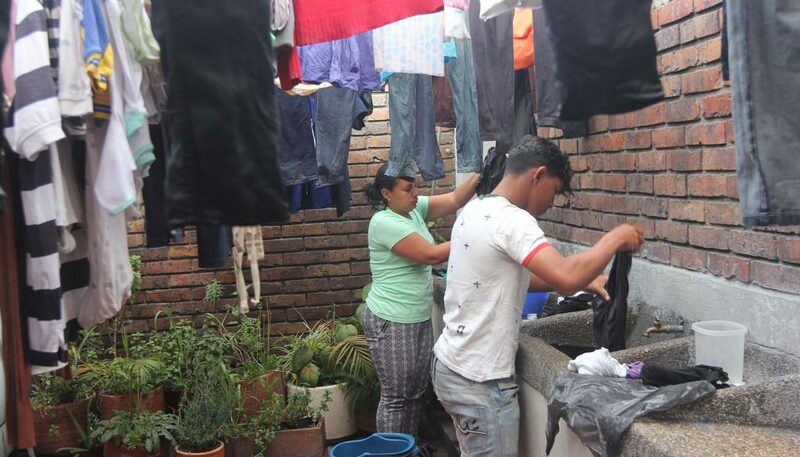 BOGOTA, Colombia (CNS) — Asiangelis Guevara sat at the dining room table at a shelter for migrants, sipping hot chocolate, holding her year-old son and encouraging him to eat a piece of bread. He gripped the food, but just stared back at her while her two daughters, ages 3 and 5, sat at a child-size table nearby, devouring their snacks and giggling at a visitor. Tiny, curly haired Ruben Dario is the reason Guevara, 21, and her husband, Ruben Dario Cazar, 28, left their home in Venezuela, with three children and only the bags they could carry, in hopes of starting over in Colombia. That was a common refrain among the steady stream of Venezuelans who arrived at a shelter run by Scalabrinian sisters July 23, the same day as Cazar and his family. Most had been traveling for several days on foot, in trucks and by bus, sometimes sleeping under bridges. At the Bogota bus terminal, the migrant ministry staffs a small office that offers assistance and sometimes referrals to the shelter, where people can stay for a few days while they look for housing or make arrangements to continue traveling to another city or country. 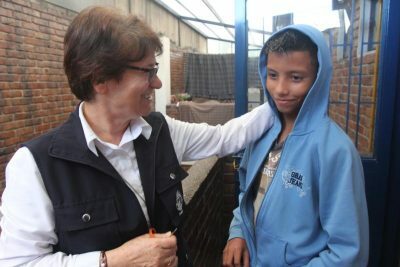 All are fleeing a situation that is growing increasingly desperate, said Scalabrinian Sister Teresinha Monteiro, who welcomes new arrivals at the shelter with basics such as towels and soap. She recalled one woman who was especially grateful for a toothbrush and toothpaste. “She’d gone four months without brushing her teeth,” Sister Monteiro said. Venezuela’s spiraling economic and political crisis has left shelves bare in stores, including supermarkets and pharmacies. Sister Monteiro has heard stories about fistfights over food scraps in garbage piles in Venezuelan cities. With the International Monetary Fund predicting the inflation rate will top 1 million percent this year, the monthly minimum wage will not buy enough flour for a batch of arepas, the corn bread that is a Venezuelan staple. The Scalabrinian sisters started their bus-station ministry in 1989 and opened the shelter in 1995. In those years, they mainly served Colombians displaced by the decades-long war involving government forces, guerrilla groups and paramilitaries. That flow tapered off in recent years, as the government and the Revolutionary Armed Forces of Colombia, the country’s largest guerrilla force, moved toward peace accords signed in November 2016. Migration from Venezuela has increased as the crisis worsened, but the sisters noticed a surge in mid-2017, Sister Monteiro said. And while most Venezuelan migrants in the past were men or single women who left the country alone to seek work and send money home, now many of the new arrivals are senior citizens or entire families with children. One 74-year-old woman arrived with two adult daughters, hoping eventually to join another daughter living in Spain. For the newcomers, leaving their homes and most of their possessions and starting all over again is not the only strain. “Many are malnourished when they arrive,” Sister Monteiro said, and some have medical problems that have gone untreated for lack of medicine in their home country. That can be especially dangerous for children and for older adults who have chronic illnesses that require ongoing treatment, she said. Some infectious diseases are also following migration routes. Venezuelan migrants have been diagnosed with measles in Colombia, Peru and Ecuador, as well as in Brazil, according to the Pan-American Health Organization. For Venezuelans with health problems, getting care in Colombia is not easy. Migrants often are afraid to seek help, for fear of being deported, Sister Monteiro said. Those who go to the hospital may spend hours in a waiting room or be turned away unless the shelter staff steps in. That’s one example of the discrimination the migrants encounter, Sister Monteiro said. Others range from comments in the street to anti-Venezuelan messages circulating on the internet in various Latin American countries, with accusations ranging from criminal behavior to illegal voting. Employment is a flash point. Without work visas, migrants end up working in what economists call the “informal sector” of the economy. Those jobs range from selling candy on street corners to off-the-books restaurant jobs, where they receive no benefits and are likely to be willing to work for less than their Colombian peers, which can depress wages for everyone. Some women end up trapped in prostitution. A taxi driver once told Sister Monteiro that two young women asked him for a ride to an area where they said they were to start work in a restaurant. Because of the neighborhood, however, he feared that they were being lured into prostitution. Despite the hazards and hardships of leaving home with only the belongings that will fit into a gym bag, not knowing if they will ever return, migrants in the shelter said they encountered bright spots along the way. Luis Eduardo Vasquez Vallenilla turned 21 the day before he arrived at the shelter. Vasquez, who said he had been a law student in Venezuela, was on a Bogota street with three other young migrants when a woman struck up a conversation with them. Upon learning it was his birthday, she treated the four to cake and coffee. Staying at the shelter can also be life-changing for migrants, Sister Monteiro said. She often prays in the first-floor chapel with people who are facing difficulties. One man sought her out to ask, “Who is that ‘Senor’ you were talking to in the chapel? '” she said. “Senor,” which means “mister” in Spanish, is also the word for “Lord,” but the man had never heard of God. He began religious instruction and will soon be baptized — an unexpected but welcome fruit of the migrant ministry. Besides the shelter and the bus station outreach, the migrant ministry includes a workshop where people learn skills that they can parlay into work. Asked what kind of assistance the staff needs most, Sister Monteiro responded without hesitation.